I sometimes have a bad memory. 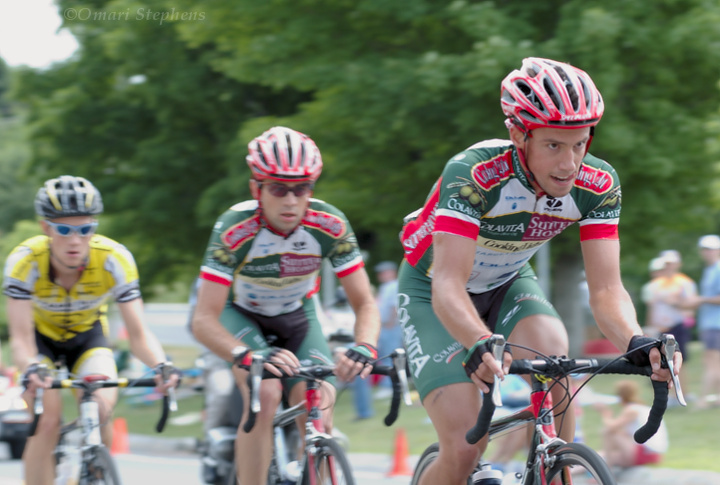 I mistakenly told a friend that I had shot two professional cycling races in the past. It's actually three. And what I've actually done is shot three road races where there was a sizable field of riders for big-name teams — the difference between a pro rider and a really good non-pro is hard to discern (for me, at least). Anyway, suffice it to say that I've shot a decent number of bike races, some on the road, others on the dirt and the mud. This is pertinent right now because tomorrow, I'm going to shoot another one. And while there are some photos which will burn brightly in my memory for the foreseeable future (the one above was a 16-second exposure at f/4.0 and ISO800), I always want to improve. I strive to improve. As good as the photos I've taken may be (or may not be, you be the judge :o), I try to work hard to make the next shots some of my best. With that said, here are some of the best images I shot at each of the aforementioned three races. Tomorrow, I'll see if I can do better. 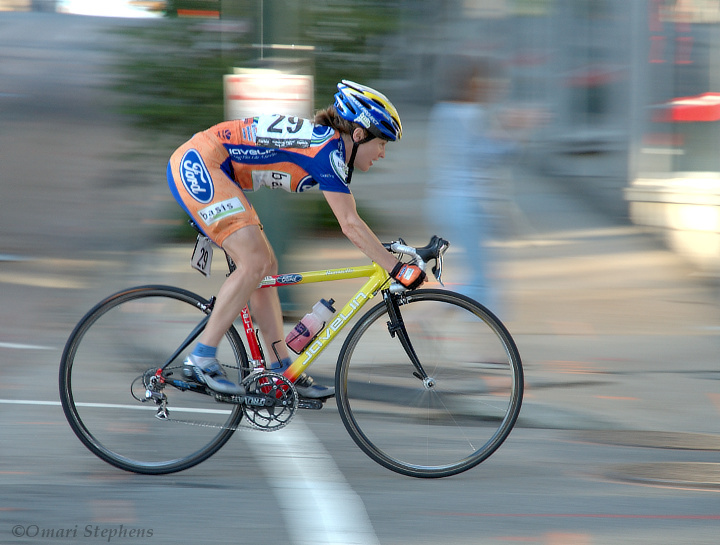 This was from the first pro race I ever shot, the 2005 Captech Classic. It was held in downtown Richmond, and I went specifically to watch Nicole Freedman, the ever-witty MIT cycling coach, race. Since I shot this, she's moved on from professional racing and is currently working toward improving cycling in Boston. While this photo came out pretty well, I was surprised by how many of the others didn't. Baby steps, I guess. This was 1/100s at f/5.0. Photography often involves a good deal of luck. You have to be prepared to jump on it when luck strikes, of course, but not everything is under your control. 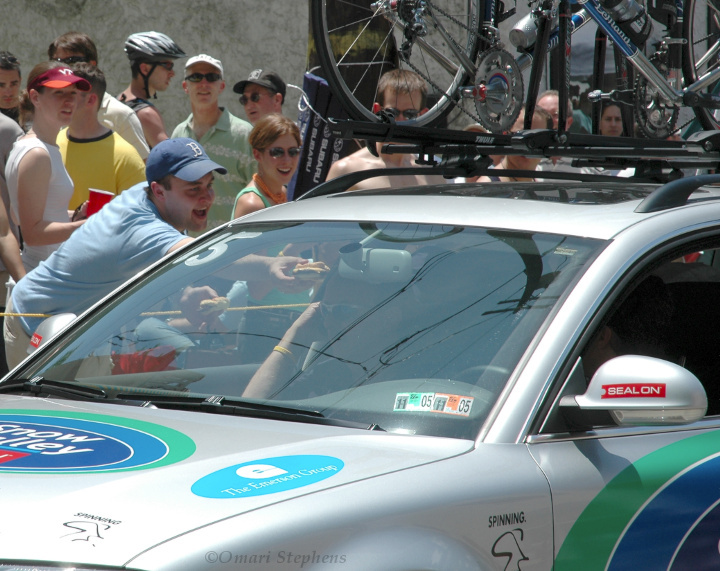 That said, about a week after the Captech Classic, I somehow managed to line up a volunteer shoot at the Pro Cycling Tour Philadelphia International Classic/Liberty Classic, to be held on July 5th, 2005 up in Pennsylvania (thanks, Bacon). Even better, Nicole was there, and I got to say "hi" again. 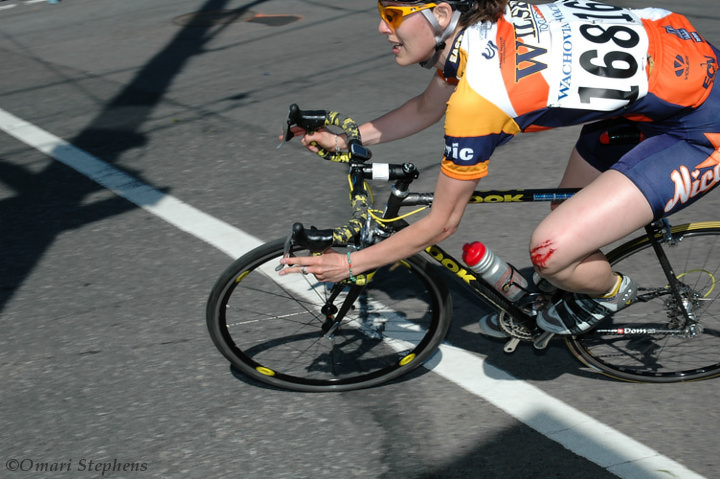 The Liberty Classic was the women's race, and there was apparently a crash sometime during the first lap. As always, when there's a crash, people get knicked up. I shot this while practicing panning on a corner of the section of course I was covering. Because all of the riders were hitting this corner pretty hard — it was the last turn before the course's long downhill — it was practically impossible to see what I was shooting. As such, I had no idea I had shot anything interesting until I got a DVD with my photos a few weeks later. Amazing. 1/640s at f/8.0. 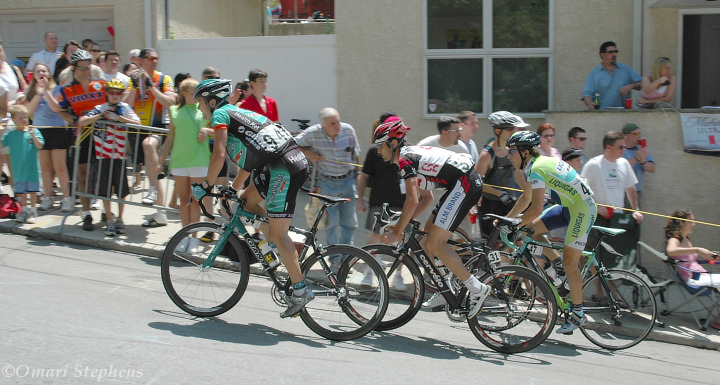 The Philadelphia International Classic includes a climb known as the Manayunk Wall. The three riders here were attacking the peloton on the steepest part of the monstrosity, apparently around a 17% grade. Just walking up the thing was dizzying. Looking back at this photo, it would have been a lot better with some separation between the riders and the crowd in the background. I shot it at 1/250s at f/10.0, though, so the light was clearly challenging. Nonetheless, I like this photo. Words cannot describe this moment. Actually, that's not true. I meant to say that there are very few words that can describe this moment. Of course, one appropriate phrase might be, "U CAN HAS CHEEZBURGER!" As I noted earlier, luck is often involved in memorable photos, but then again, so is preparation. This was 1/320s at f/10.0. 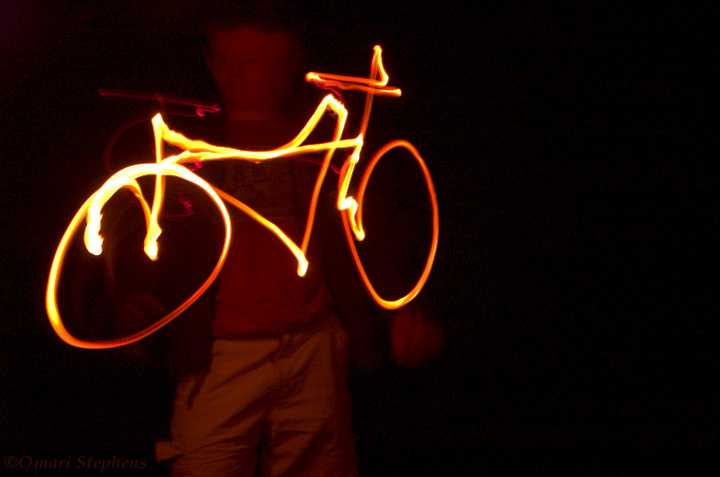 (Judging from the photos I shot) I was concentrating on getting tight portrait-like photos of the cyclists. Fortuitously, the other MIT/Harvard folks were hanging out in the feed zone, which is where lots of interesting stuff often happens. This rider grabbed a bottle of water, and immediately dumped it on herself. Fortunately, I had my eye on her and nailed this shot at 1/400s and f/5.6. On the flip-side, though, there was an even better shot that I completely botched, where a feed-zone person was tossing water on a racing teammate. Oh well; baby steps. Whenever I shoot an event, I try to look for and capture details that aren't the main focus of the event, but which add to and help to define it. For the Philadelphia races, those details often dealt with the crowd, which was huge and completely off-the-wall. 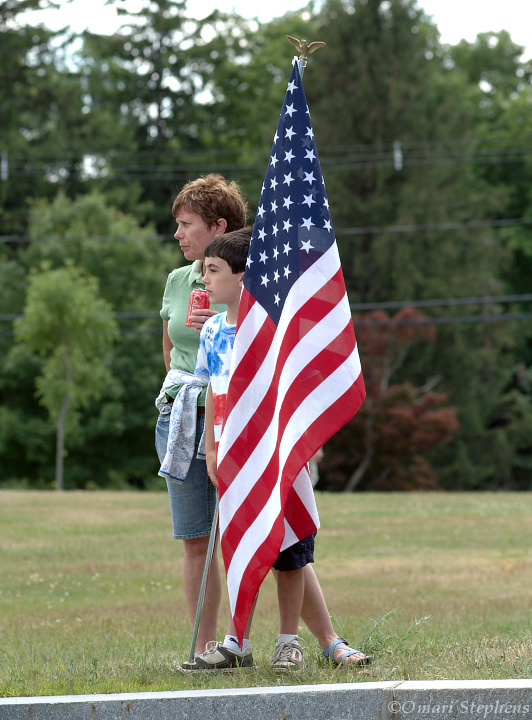 At the Fitchburg stage race, by contrast, many of the spectators were family members or teammates who had trekked out to support friends and family. I don't really remember why this pair was out there, but I presume the flag was at least related to the proximity to Independence Day — the race ended on June 30th. Regardless, I caught the moment, and I think it added to my coverage of the stage. I shot this at 1/200s and f/5.6. After taking an agonizing trip up Wachusett Mountain to watch my teammates finish, and subsequently taking a screaming descent back down, I ended up at the feed zone again, where I managed this shot. The locale was fitting, given just how hungry the Colavita rider on the front looks. He was working like crazy that day — I have photos from at least three different laps where he was pulling. I have no idea how he finished, unfortunately. This was 1/100s at f/5.6. "When you go, you can't think of anything else but the effort. You have to attack, give it everything, concentrate; emotions are for after the finish. Courage and guts are what's needed to succeed."